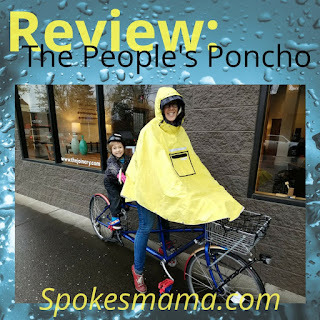 The People's Poncho has a few biking specific features: loops under the front side to hold on your handlebars, an elastic waist belt to keep it from flying around in the wind, plus a large, adjustable hood that does fit over a helmet. 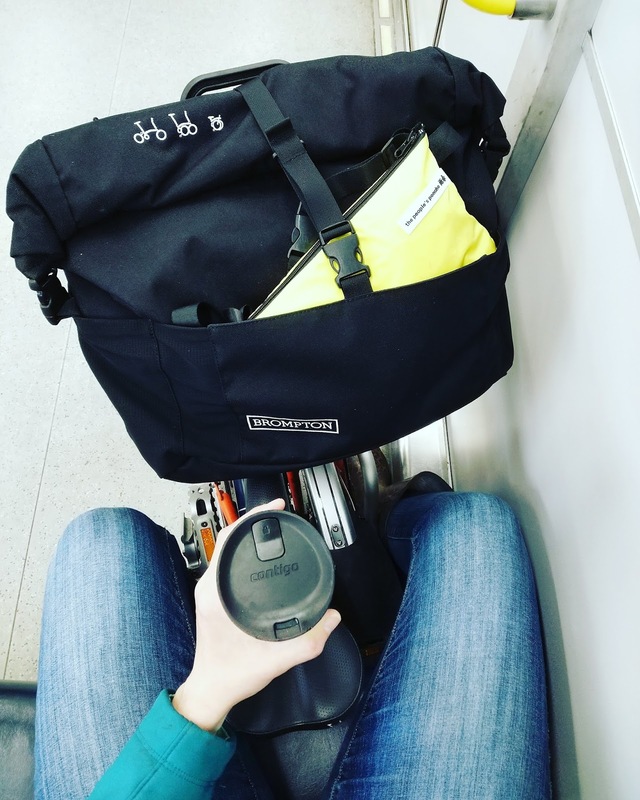 I like the placement of the handlebar loops--they were easy to find "blind" under the poncho were just wide enough for my Bakfiets handlebars. They also sit well on the M-bars of my Brompton. One downside to the loops is that water does seep through the poncho onto my hands where the loops are stitched on. Of course, my hands are still a lot warmer & drier than when I use my rain coat, so I'm happy enough with a drip or two. When I drape the poncho over my handlebars, I find it protects my legs down to about the knees. My rain boots are nearly that high, so I don't need rain pants for shorter rides or in lighter rain. This is a huge bonus for me--I hate taking off my rain pants when I get where I'm going. Soooo awkward! If it's windy the rain can blow in from the side from about mid thigh down, but I haven't really gotten damp enough to need to change my pants at my destination. The belt on The People's Poncho is a little low for me, but I've got a hilariously short back & high waist--this poncho is a unisex fit & since the belt is elastic, I can usually keep it down over my hips well enough. Unlike my old poncho, which was only for cycling (super awkward to walk around it because it was very long in front, while short at the back & didn't cover my arms) The People's Poncho works well for walking too. 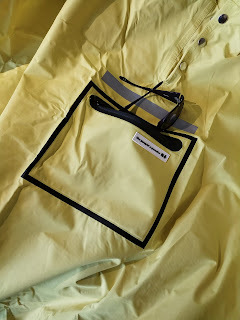 There are three snaps along the hem on each side to make it into "sleeves", plus the adjustable hood has a stiffened brim to help keep rain out of your face. Both pedestrians & cyclists can benefit from the reflective piping on the shoulders & hem of the poncho. 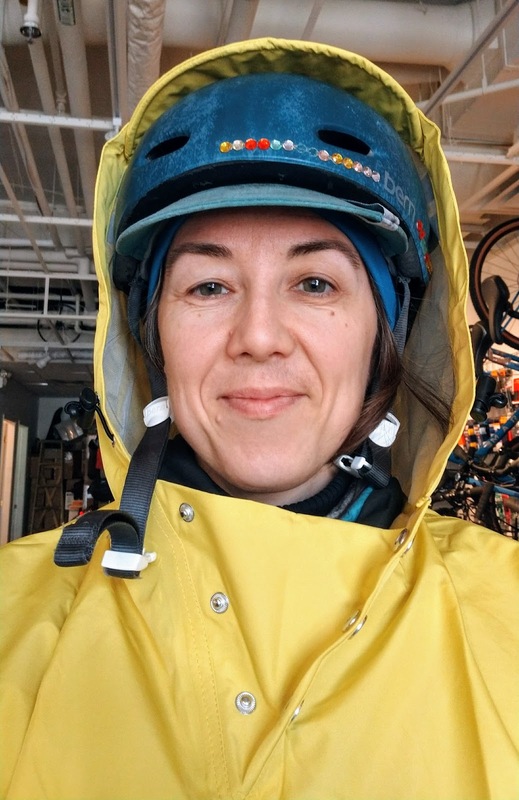 I could see myself using this poncho on a bike with the snaps done up in the summer, when the weather is warm enough not to care about getting my hands wet. I also used it while walking around the Woodland Park Zoo when we were visiting Seattle during Spring Break. 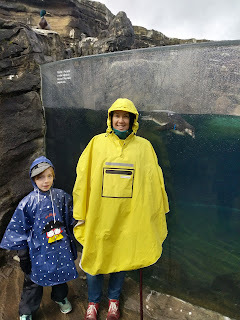 My hip was sore that day so I was using my cane & found the poncho to be great for this--my hand stayed dry & a bit warmer, unlike with my trench coat. My old poncho always stuck to my legs in the front, dripping water all over my shins. 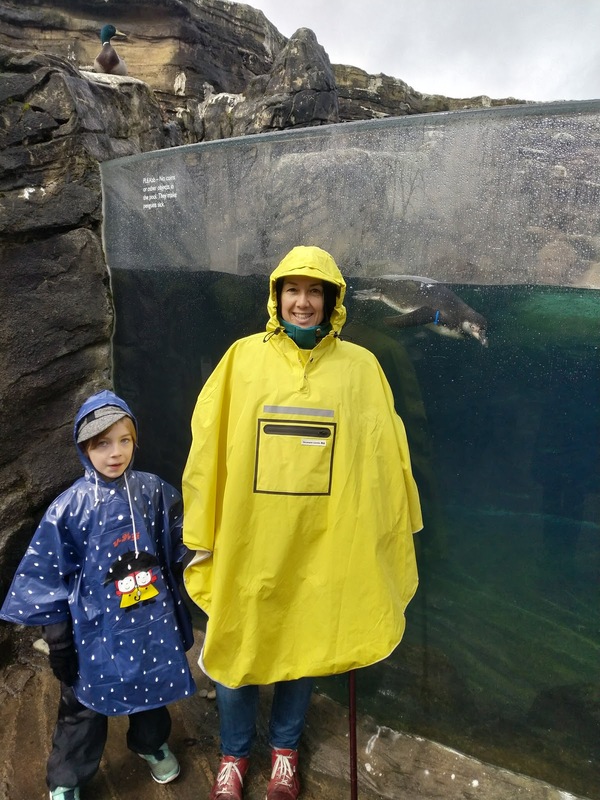 I like the length of The People's Poncho & the way it hangs kept me dry when I was walking to & from my bike or wandering around at the zoo. The shoulders are quite wide & rounded & the fabric is somewhat stiff, so it's not necessarily a very flattering fit. I also found that I still got damp shoulders, just as I had with my other poncho, but this is basically condensation from being slightly overdressed, not leaks. I am one of those people who always overdresses--I'd rather be sweaty than too cold! 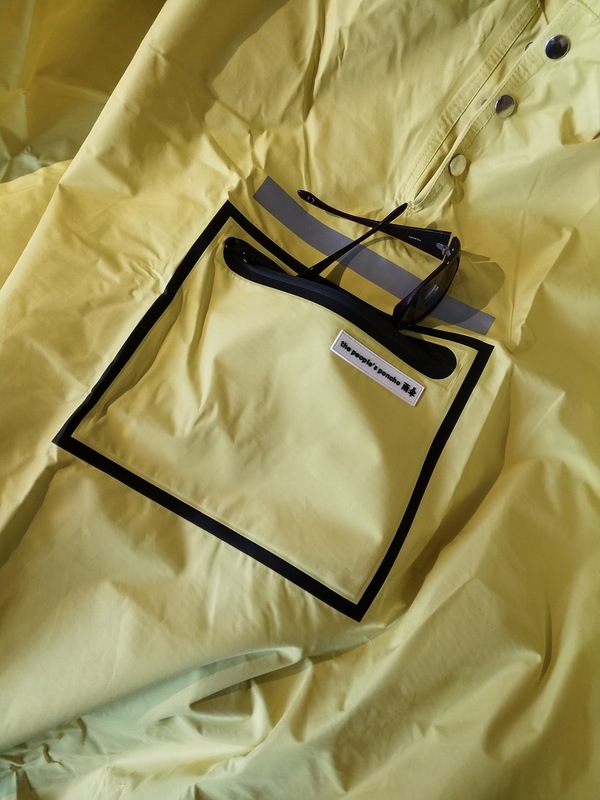 The People's Poncho is made of triple layer breathable membrane, with a waterproof rating of 12,000mm that consists of Japanese polyester, TPU coating, & tricot knit on the inside. Of course, no waterproof gear is really ever that breathable, so I'm not too concerned. The People's Poncho has a pocket on the front of the chest with a waterproof zipper. It's not large enough to fit too much stuff, but do you really want a big lump of your possessions flapping around in front of your chest? For the minimalists among us, who hate bringing a bag or purse if at all possible (raises hand) this is handy for the bare essentials. Most of the times it's kept my phone nice & dry in there, but it did seem to leak once--not sure if the water got in through the zipper or possibly before. The last thing to mention about this poncho is how compact it folds up. The People's Poncho comes with a small pouch that has a waist belt on it, so you can carry it over your shoulder, strap it to your bike, or wear it as a fanny pack. It's quite convenient to toss into a bag in case of rain. The People's Poncho is $120 at Sidesaddle Bikes, & with shipping & the exchange rate will cost you about the same online. (hint, hint: support your local bike shop!) The poncho comes in five colours: yellow, red, navy, black, & camouflage. Disclaimer: I received a free poncho from The People's Poncho to facilitate the review. I was not otherwise compensated for writing this piece. Opinions above are my own, technical specs come from the People's Poncho website. Thank you for the sales job. How were night rides? Ha! You mean visibility at night? Pretty good in this poncho--reflective stuff all along the hem & stripes on front & back.